Yeah, the above even looks like a Modern Art piece, but it's actually how we as humans see color. Now, the sun sends it's white, invisible light out in all the spectrums, but we can only see a part of it. That is, the white part which is actually all colors together, which make White in the light Spectrum (not the art spectrum, wait a bit for explanation....) Now, the light hits an object, an apple in this case. What is important to remember is that we DO NOT see just the red spectrum of light, but we see every other spectrum except that one! 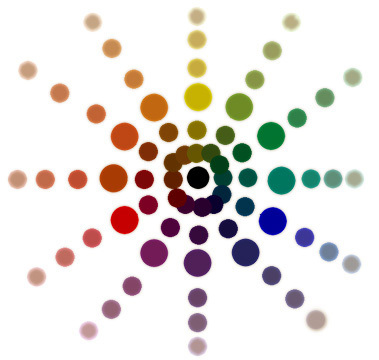 Every color except red is absorbed by the object, our eye sees this and sends a message to our brain. Our brain then interprets this as a red apple. The best example of this dependent effect of light on color is seen when a colored lamp is put on something. If we had a red lamp and turned it on in dark closet, everything would be red... that's because there's only red light to bounce off of it! The names of these depend on their placement, the one between Green and Yellow, for example, is Yellow-Green. Now, this can get a bit confusing with the two names, but just remember the primary name is never last, and it always lets you know that the color looks a bit more than that primary than it would be just half and half. 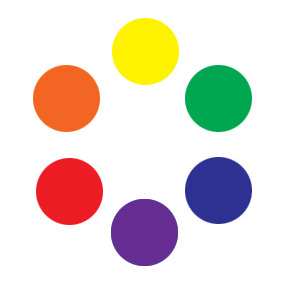 The only exceptions on the color wheel with Tertiaries is that it is not called Red-Purple, it's known as Violet, and sometimes Blue-Green is called Turquoise... I don't know who made these rules, I just follow them to a point. Note that it's easier to get all the Secondary or even Tertiary colors rather than big bottles of the Primaries, because you would be mixing all day and not painting.. In fact, in mini painting, the more paints of varied colors you have, the less mixing you have to do! 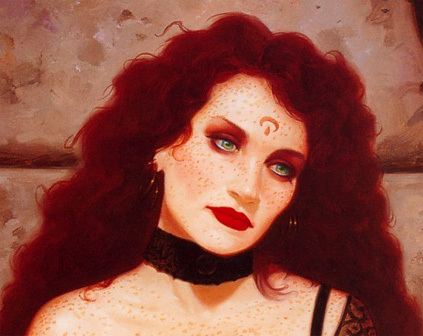 In Brom's "Loveless, most everything is red. The women's lips, her skin, her hair, the background stone, but one thing stands out the most: her green eyes. Of course this was by design of the artist's thoughts, even if he didn't do it consciously. This configuration makes her eyes glow and sparkle. Thus, complementary colors stand out if one is placed on top of or near another. Another good trick with Complementary colors is they can add contrast. By mixing yellow with purple, you get a mustard brown color that is perfect for shading! The same can be done with all colors, and in fact I advise you to mix a complimentary in just a bit next time you're doing shading and see if it stands out more! 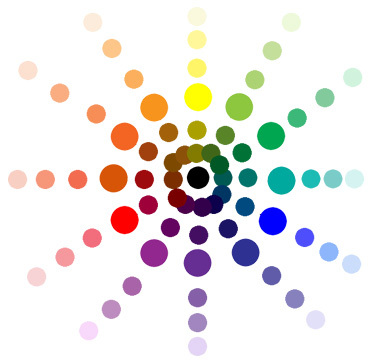 Colors can also be Complementary by Threes. That is, in a triangle you get three colors of the color wheel that look good together. The Primaries are Complementary by three, or a Triadic Complement, and so are the Secondary. The Tertiaries would be, too but they're harder to figure out just a bit.. A good way with any complement is to remember that all complements make Yellow, Blue and Red.. So two complements like Yellow and Purple would make all the colors (Yellow being a Primary, and Purple being a mix of Blue and Red). 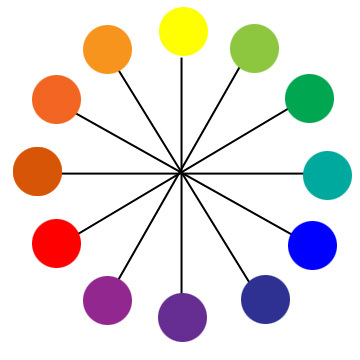 There are also complements in fours, but o a colors wheel of 6, you're taking most of the colors. It's best to remember this works for all major details like cloaks, shirts, pants, and boots and tiny little details factor in the color scheme, but not that much. Sturmhalo's Harbinger of justice is the best example of a muted, Analogous color scheme. Note the skin matches the cloak, which matches the boots, which matches the bow, which matches the hair to an extent.. about the only thing not brownish is the metal, but it's a given metal should be metal colored! Now, do not get Analogous and Monochromatic confused. Analogous is colors really close together. Monochromatic is just one color for everything. like if you sprayed a mini all red and said it was done. Blue, Purple, Blue Green and Dark Green are all "Cool" colors that are usually described as "relaxed, calming, serene".. if you're a hippie. 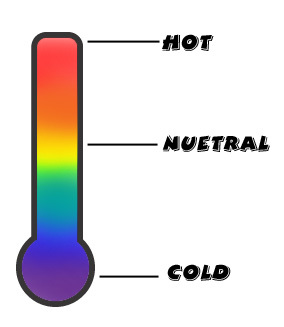 The "Warm" colors are Orange, Red, and bright Magenta which all "excite and aggravate" us.. again, if you were a hippie. Yellow and Green being in the middle are neutral to a point, and so is brown. These two could be used with about anything and it would fit in if it was in the right place. Now, the important thing to remember in Warm and Cool colors is that in shading, Cool colors look better, and in highlighting, Warm colors do better. Thus, if you were highlighting Green, you would use Yellow for a highlight. Some colors do not do well with Black and White, so this is the only way some of them will look good. See Tints & Shades Below..
As you can see, yellow gets this ugly olive color that would not be good if you were doing something yellow that is not camouflage. As stated above, you could use green for a shade or add purple to make a better shade. White also makes Red pink, which would not be used on fire. You would either use Orange or a brighter Magenta to highlight it. Notice how the Warmer Colors stick out more in the Shades than the Cool colors? That's not a coincidence. It's strange, but the human eye see more of Green than any other color, but some colors like Yellow just appear too bright to us that we sometimes mistake a bright yellow for a dark or faded white..
Notice that the first color is what I call a "true" brown, while the next color looks like a yellow, then next an orange, and the last a red. However, you note that they are not as bright as they should be. "Should be" being a relative term, because colors are that dingy in real life. Though it is good in the mini world to use bright colors, natural colors also have a good effect. All of the major colors are dingy, making them earth tones, while the metallics shine because of their natural reflective qualities. No, that statement is true. Not all of that sentence is Pink. It looks like Pink to you, although it looks a bit transparent. But then stop and think: the Pink on the White side is Pink, and the other letter are different. That's because they're PURPLE! And as we learned above, Red and Blue make Purple. The optical effect fakes you out into seeing that the letters are transparent. If the blue was not there, it would be a part purple, part pink sentence. This can be used all over that place. If blood was spattered across something painted, you could mix it in to make a transparent effect, even though it would be different colors. Another tip about White and Black: When painting them, remember to save White for the Whitest of the White that every Whited and Black for the Shadows of the Black object in a room at night. Human eyes can see differences in color but our brain has been taught to call things when we were growing up. The best solution to this is to use an off White Grey or Beige for White things and use White as a final and absolute highlight. 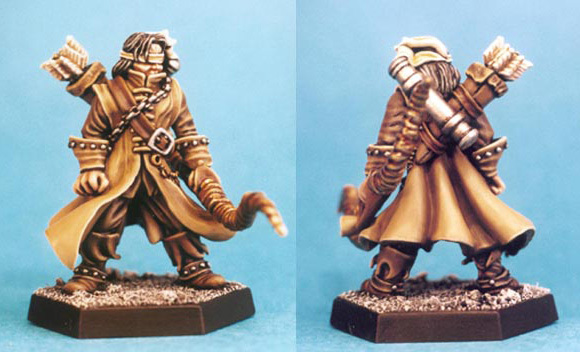 By the Same token, Black should only be used as a shadow on a black, matte object and the rest should be basecoated with a slight difference in a Dark Grey or even Blue. It should also be noted that all shadows are not Black. In the art world, things just have darker colors for shadows, much like using a cooler color. Remember to keep the figure cohesive in colors. By that I mean if you use dark colors, keep it kinda like that. A giant patch of ultra bright Yellow or Orange on a dark Blue mini looks loud and garish looking. If you really want to use Yellow, use a darker kind of Yellow, like that mustard brown you get with Purple and Yellow.. This is just because you have to remember that the whole figure is in the same light, to unless there is a flashlight on just that part, the whole figure would have the same variation in colors. Black can be black. It not only depends on the light environment or hue, saturation or value. It also depends on the material being used. A glossy material tents to be much more black than a matte one. Soot tends to be much more black than velvet. Different materials reflect and absorb differently. Soot for example nearly doesn't reflect anything ever. You can easily check that by taking a spoon and holding it over a candle for a while. It will turn black. A black that is always black and nearly never grey. So while your colour theory is all nice and good, one has to take the material of an object into account.